The recent killing of Zimbabwe's beloved Cecil the lion, at the hands of an American hunter, has ignited a firestorm of controversy in neighboring South Africa, a top destination for hunters looking to bag exotic trophies like lions, leopards and the like. South Africa's hunting industry is a hugely profitable one, bringing in hundreds of millions of dollars per year. 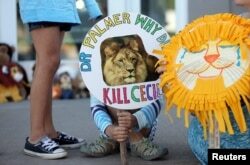 But Cecil's killing at the hands of a Minnesota dentist has sparked debate and consternation over the industry’s future. Peter Oberem, president of Wildlife Ranching South Africa — a group that represents game ranchers in South Africa — supports the idea of hunting in controlled environments, but says Cecil's death does not fill those criteria. "It's a tragedy actually because he's a lion that, as I understand it at least, was from some swanky game reserve and was lured through the fence, which is an unethical process and which therefore should be condemned outright, no problem," he said. The White House has received close to 150,000 signatures by Americans demanding that the U.S. dentist who killed a popular lion in Zimbabwe be extradited there for trial. Thousands of others more added their calls on social media. Conservationists are stepping in to demand a ban on importing animal trophies that attract many Americans to big game hunting in Africa and elsewhere. Conservationist Dex Kotze believes that the incident will reshape the debate across southern Africa about "canned" hunting — in which hunters are allowed to target animals bred for hunting. He says this particular incident has already prompted statements from top South African officials who say the nation's hunting laws might need to be reviewed. 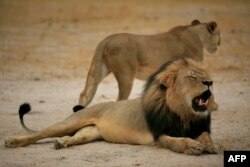 "The regulation needs to be changed to eradicate canned lion hunting," said Kotze. It's wrong, it's immoral, it's unethical." But Oberem disagrees, and says hunting can help with population control and can be done humanely. "When they are endangered, there is still a role for hunting but then it has to be very, very carefully controlled and it should be the older animals that, shall we say, are about to die anyway," he suggested. "I don't know about yourself, but I'd be quite pleased when I reach the end of my time, suddenly I'm taken out rather than having to die in hospital and having my feet amputated, or some of the old age problems." For the record, Oberem added, neither he nor his organization supports hunting elderly humans for sport. Kotze says hunting older animals is not as common in South Africa as hunters may want to believe. In some South African game ranches, he says, animals are released for hunting while only days or weeks old — and, key to trophy hunters, free of the ugly facial scars they would likely earn in the wild. This debate, experts agree, is long overdue — though it has come far too late for Cecil. Zlatica Hoke contributed to this story.